Leaked footage of gameplay from Activision's Modern Warfare 2 has the Australian Council on Children and the Media calling for the game's MA15+ to be reconsidered, effectively banning it from sale. The skippable scene of terrorist atrocities in Modern Warfare 2 first came to light via leaked footage on YouTube early yesterday. News travelled quickly, however, with an AP report dropping yesterday afternoon, distributing the news to just about every news organization on the planet. Word obviously reached Australia, prompting Australian Council on Children and the Media Jane Roberts to call on the Australian Classification Board to reconsider the MA15+ rating the game received, which is the highest rating given games in the country. Reconsideration would effectively ban the game from release. Roberts claims that even with the MA15+ rating, the game would still be readily available to children. "The consequences of terrorism are just abhorrent in our community and yet here we are with a product that's meant to be passed off as a leisure time activity, actually promoting what most world leaders speak out publicly against." Do not read on if you wish to avoid Modern Warfare 2 spoilers. Here's the report regarding the offending scene filed by the Classification Board that accompanied the MA15+ rating decision. "Several civilians are shot with blood burst bullet wounds; civilian corpses are strewn across the airport floor, often in stylised pools of blood; injured civilians crawl away with lengthy blood trails behind them." The report goes on to mention that you cannot inflict post mortem damage on the civilians, and that all other missions of the game will result in failure if a civilian is shot. Activision released a statement to Kotaku yesterday regarding the scene, explaining that it was "meant to evoke the atrocities of terrorism." Back in Australia the debate rages on, with Nicholas Suzor, spokesman for the lobby group Electronic Frontiers Australia, using the situation to call for a R18+ rating for games released in the country, while rejecting the idea that a video game could foster terrorism. "Films often show the villain's perspective and, by doing that, they get across the character's story and the heinous nature of people who carry out atrocities. Games, too, are becoming more expressive, and are telling more involved stories. We may make an argument that these sorts of topics are not suitable for children, but I don't at all accept that it is unsuitable for adults." The Classification Board cannot review its own decisions, so anyone interested in getting the rating reviewed will have to apply directly to the board. 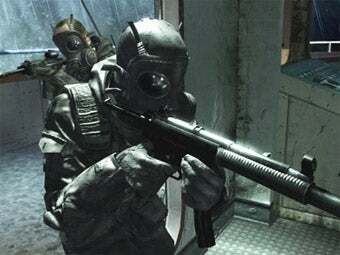 Call of Duty: Modern Warfare 2 is slated for Australian release on November 10th.